Want to cover EVERYTHING on the NCLEX-RN? HESI can help! 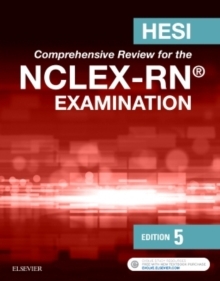 The HESI Comprehensive Review for the NCLEX-RN Examination, 5th Edition provides a comprehensive, all-in-one review of the information you need to know to not only succeed on the NCLEX-RN exam but also on your program's HESI exit exam. Written in an easy-to-read outline format, this trusted guide breaks down chapters by clinical areas and the concepts emphasized on the NCLEX-RN exam. Rationales are provided for any incorrect answers or areas of weakness to help strengthen your understanding. The companion Evolve website also offers 700 practice questions in both study and exam formats to give you valuable practice using the same electronic testing format you will face on the nursing school exit exam and on the NCLEX-RN exam. 700 NCLEX practice questions on the companion Evolve website include alternate item formats to provide a testing experience similar to the exit and NCLEX exams. Chapters organized by clinical area enables you to easily search for various topics to review. HESI Hint boxes spotlight important clinical information and concepts commonly tested on the NCLEX-RN exam. Critical thinking study questions (with rationales) reinforce key concepts and content. Fill-in-the-blank and prioritizing questions mirror the new alternate item format item types included on the NCLEX-RN exam. Pharmacology tables highlight the need-to-know drug therapy content emphasized on the NCLEX-RN exam. Consistent format and chapter organization make it easy to move between topics when reviewing. NEW! Updated content reflects the latest NCLEX-RN test plan. NEW! Updated medications and nursing interventions have been added based on the latest evidence-based practice. NEW! Revised chapter on pediatric nursing includes an updated immunization chart, referral websites, and new content on children with disabilities and chromosomal and genetic syndromes. NEW! Revised chapter on maternity nursing features updated CPR guidelines and medications for neonatal cardiac arrest, as well as new HESI Hints that reflect new modalities such as fetal cell-DNA analysis and current screening tools. NEW! Revised chapter on psychiatric nursing includes new information on autism spectrum disorders, as well as updates on DSM 5 changes. NEW! Revised chapter on geriatrics features new content on polypharmacy in the elderly, the Geriatric Depression Scale as an assessment tool, the Mini-Cog tool for mental status assessment, and new information on elder mistreatment in various settings.